Of the 442 people elected to the Blackfeet Tribal Council since 1936, only nine have been women. Betty Cooper is one of those women. Cooper, now 80, was elected to the tribal business council in 2004, earning more votes than any of the other eight men on the council. But during her time on the council, Cooper said she was constantly undermined. A video recording of a 2006 council session shows the men on the council interrupting Cooper. In the video she was calling for the council members to be better communicators. “What? What are we… Point of order Mr. Chairman?” one of the councilmen says. Another councilman chimes in, the pitch of his voice rising like a desperate child toward a parent. “Mr. Chairman, I was speaking and she always does this. That is my concern, Mr. Chairman,” he says. Cooper sits stoic, her eyes straight ahead, her face unwavering. “I always said, ‘I’m not here for this guy or that guy. I’m here for the Blackfeet people and what is best for them,’” Cooper says now. As it did to many tribes throughout the nation, American political and religious colonization undid many of the traditional gender roles on the Blackfeet Nation. 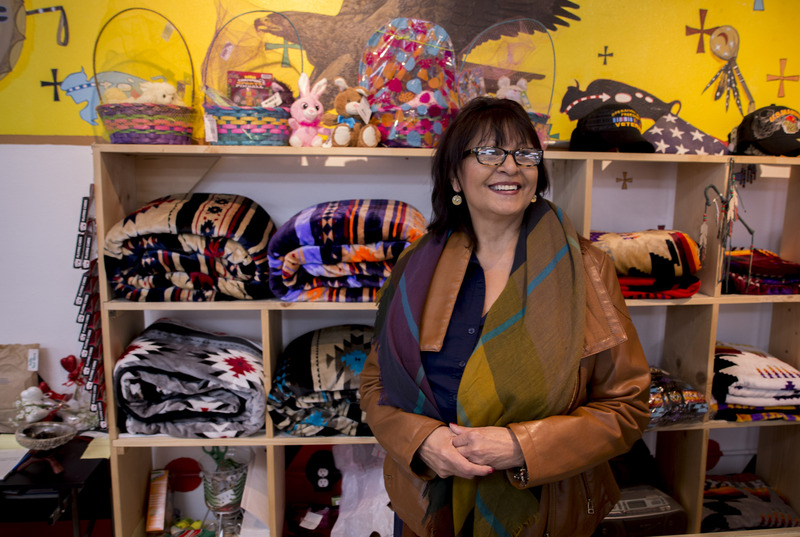 Historically, women owned all property and led religious practices in Blackfeet society, while men were traditionally political leaders, according to Rosalyn LaPier, a professor at the University of Montana and enrolled Blackfeet tribal member. But for more than a century, the cultures of the tribes which make up the Blackfeet Nation were manipulated to serve the social constructs and power dynamics of a society dominated by men. Missionaries, specifically the Jesuit sect of the Catholic Church, worked to strategically implement men as the new Blackfeet religious leaders from 1890 to 1940 as a strategy for male Catholic priests to more easily convert Blackfeet people to Christianity. “There was a concerted effort to educate children, to convert children, but also to change over this idea that women were the center of religious practice,” LaPier said. Her daughter Iko’tsimiskimaki Beck wrote extensively on the subject for her senior thesis at Harvard College. However, in recent years, women have increasingly become the icons for Native American movements. For instance, Elouise Cobell, possibly the most iconic name in modern Native American leaders, rose from being a treasurer for the Blackfeet tribe to leading the largest class-action lawsuit against the federal government in history. The lawsuit, claiming mismanagement of Native American lands by the federal government, was settled for $3.4 billion in 2008, with the restitution earmarked for the plaintiffs and land buy-backs. Additionally, the main camp of the Standing Rock protests of 2016, the Sacred Stone camp, was founded by LaDonna Brave Bull Allard, a Sioux elderwoman. The protest, aimed at stopping the Dakota Access oil pipeline, grew well into the thousands of participants due in large part to its viral spread on social media. Before the #metoo movement brought sexual harassment and abuse of all women into the mainstream spotlight, the #MMIW hashtag, which stands for missing and murdered indigenous women, created viral awareness of the disproportionate number of cases, often left unresolved, of Native American women affected by violent crimes. Theda New Breast held up her slim black smartphone. Sandy Schildt currently helps at her mother’s store Glacier Way C-tore in North Browning, but is running for Tribal Council. New Breast, 62, lives alone near Babb, on the eastern edge of Glacier National Park. Although her cabin is isolated in the northern reaches of the Blackfeet reservation, she stays well connected. With 5,000 friends on Facebook, New Breast commands a small army with every post. She recently began a campaign posting the names of one missing or murdered indigenous woman every day to raise awareness of the issue. The photos get hundreds of shares per day. She says social media has become one of the only outlets for Native women to have an unfiltered voice on the Blackfeet Reservation. This reorganization act is the 1934 federal law which created the boilerplate American influenced constitutions and governing bodies on the reservations, like the Blackfeet Tribal Business Council. Previous to that, elders of both genders helped lead the tribe politically and religiously. Since the Indian Reorganization Act, only about two percent of Blackfeet council seats have been filled by women. New Breast is the daughter of Betty Cooper, one of the nine women to have ever served on the council, and she witnessed the psychological abuse her mother endured as the only woman on the council at the time. Cooper said she had planned to run for council chairman, chairwoman, actually, she corrected herself with a chuckle. But that never happened. Cooper wasn’t re-elected in 2008, and instead worked as a field manager for Barack Obama’s first presidential campaign. As her daughter would say, she hit the buckskin ceiling. Susan Webber teaches women’s studies and other courses at Blackfeet Community College — a role she relishes: teaching young people that Blackfeet women were traditionally centers of authority. She points to the federal government’s General Allotment Act of 1887, when tribal lands were parcelled up and put under men’s names, as one of the catalysts that robbed Blackfeet women of their power. Webber holds fast to those roots. After holding numerous administrative and directoral roles in the tribe, Webber was elected to the Montana House of Representatives in 2014. This year, she is running unopposed for her state senate district. Webber said some women on the reservation unwittingly help perpetuate stereotypes and power structures that make it harder for women to rise into positions of power. She specifically mentioned a sentiment she has heard before: women bicker too much to serve on council. “We have to overcome 100 to 150 years of an oppressive stereotype of Indian women,” Webber said. Before running for state office, Webber worked in the tribal enrollment office, the tribal court and a slew of other tribal agencies. She said she regularly saw men treated preferentially over women, giving the example of the time she caught a man she oversaw at the tribal health office stealing a total of $80,000. Sandy Schildt spent a day composing her thoughts before settling down at her computer to continue a lengthy Facebook post about the Blackfeet Tribal Business Council. 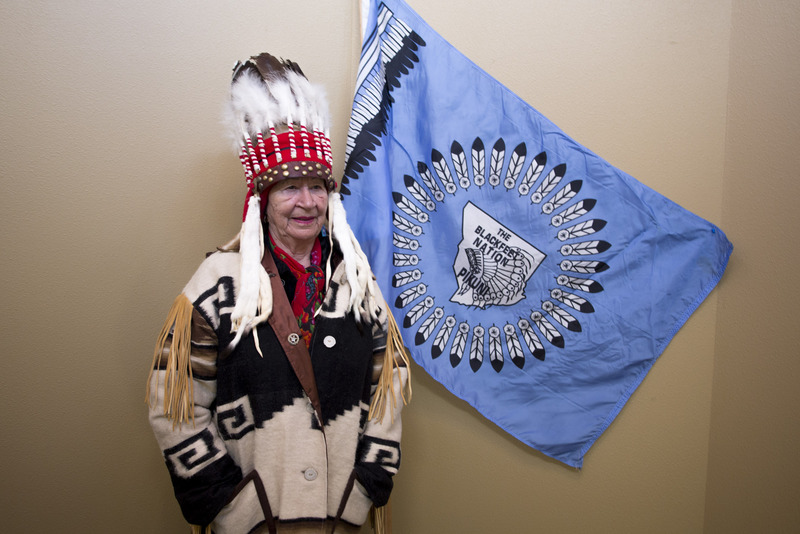 Blackfeet elder Betty Cooper was the seventh of only nine women to serve on the Blackfeet Tribal Business Council and remains a leader in the community today. From the house behind the convenience store and gas station her family owns in North Browning, she usually writes about a lack of transparency, a need for better record keeping, and wasteful spending by the council. After a decades-long career as a data compliance specialist and trainer for the federal Indian Health Service, and as a freelancer, she has tried to bring her expertise to the council, mainly in the form of presentations. But after her proposals were shot down by the council or ideas sold off to other contractors, she took to the pulpit of Facebook. On April 8, around 10 p.m., Schildt drove her minivan a mile to the Tribal Administration Office, passing the neighborhood of half-built homes which were abandoned when the federal funding ran out. Filing for the tribal council candidates opened the next morning at 8 a.m., and she was intent on being the first to sign up — meaning her name would appear at the top of the ballot. It was just 23 degrees, and windy as always, but she had a thick fleece blanket and her red camping chair. She set up under the incandescent light of the tribal office’s awning, outside the paint-smeared glass doors. At the end of the sidewalk, a stop sign caked in mud rested face-up in a puddle.